Buy household aluminum foil 8011 o in Haomei Aluminum can save your time and cost with quality guaranteed and fast production. Household aluminum foil has outstanding advantages in gas barrier properties, moisture permeability, hygiene and safety, production efficiency, recyclability and environmental protection. Food grade aluminum foil packaging materials will be the development trend of green safety packaging. The household aluminum foil 8011 o produced by Haomei Aluminum have undergone strict pinhole detection, degreasing process and plate type control, which can achieve ultra-high sealing performance and perfectly protect the quality of the wrapped object. According to the practice of major food and pharmaceutical packaging materials manufacturers, the household aluminum foil fully meets food grade requirements. 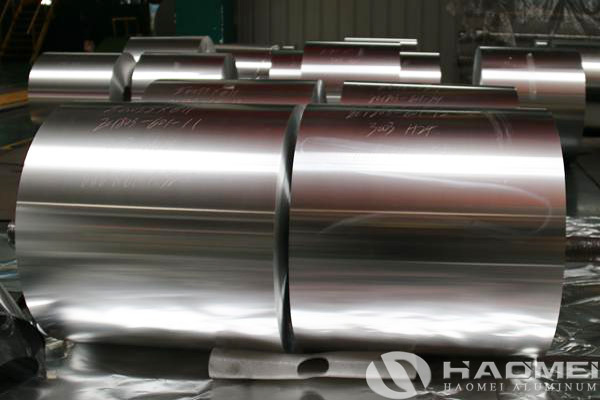 For supply 8011 household aluminum foil jumbo roll, Haomei has strict quality requirement, the surface of the aluminum foil should be smooth and clean, corrosion, wrinkles, foaming, indentation, ribbing, and opening defects are not allowed. The dark side of the aluminum foil is not allowed to have bright spots, bright lines, roll eyes, and uneven oil. The end face of the aluminum foil should be neat, clean, free of burrs, loose rolls, bumps and serious string, arrow, pattern defects. Buy household aluminum foil 8011 o jumbo roll to process the final household foil small rolls processed, it is often used in home baking or family barbecue. There are several advantages to using aluminum foil: one is to prevent food from sticking to the baking tray and to clean the baking tray; When roasting food with seasoning, it can prevent the seasoning from falling; thirdly, it can prevent water loss and keep the food fresh and tender; fourth, cover the aluminum foil paper when baking bread or cake to prevent the surface from being too dark; Allow food to heat evenly and prevent burning.